SHEILA and Jeff Elder farm near Wawanesa, Manitoba, Canada. They frequently reference Canadian Grain Commission (CGC) moisture charts at harvest to determine their grain’s suitability for storage. At almost $250, Sheila found the app version prohibitively expensive. Her husband challenged her to build her own. With her background in health care and his in agriculture, they had zero coding experience, but Sheila bought a MacBook, took online courses and learned Swift, the coding language for Apple applications. Sheila has learned from codewithchris.com, a Toronto, Ontario, company and now recommends online coding courses for those building apps from scratch. Owner Chris Ching explained that his fundamentals course provides 24 hours of video lessons that he recommends students take over a few weeks. The CGC gave the Elders access to the equations used to determine the moisture content of grain. Now, rather than flipping through a paper chart, farmers can enter the grain type, temperature and moisture meter reading into the couple’s Grain Moisture app, which displays the moisture content. They released their app on Apple’s app store for $5.49. More than 900 users have downloaded it over two years. As the app’s creators, the Elders received 70 per cent of the return, covering the cost of Sheila’s laptop and the annual app store fee of $99 USD. When iOS or Android operating systems are updated, app developers must update their products. Over two years, Sheila has done six updates. “You have to keep learning,” said Sheila. Although she didn’t develop an Android version of her app, such an app is available through Google Play. David Ricardo and his brother farm in New South Wales, Australia, operating equipment stored in various locations. They maintained detailed service records, but the record book had to move between the brothers’ yards. Once, it went missing for months. Ricardo envisioned a better way. For one full year, he researched the development of an app to replace hard-copy service records, but realized he needed professional help. “I knew I needed a team of developers,” he said. He hired programmers with experience in iOS and Android as well as database and design specialists. Freelance programming and design specialists can be hired through websites such as upwork.com and freelancer.ca. 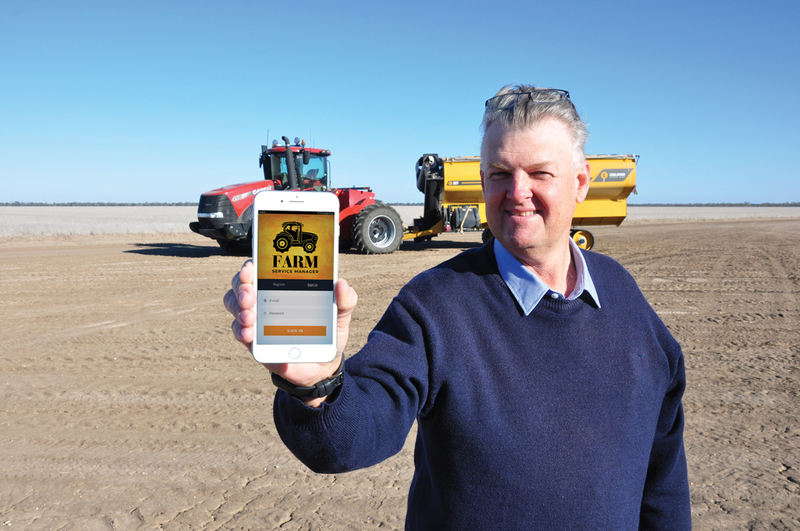 His app, Farm Service Manager, allows farmers to record and access equipment service records from any mobile device with the app and subscription access. Pictures, services completed, tools used, mileage or hours and who performed the work can all be recorded in the app. One of the biggest challenges Ricardo encountered was app design. Alongside professional app designers, he worked to perfect navigation between pages on portable device screens. The app cost him $50,000 to build, with ongoing costs of about $5,000 per year to cover web hosting and database storage. During the first two months of the app’s release, he recouped half his development costs in subscription fees. No matter who builds it, an app must serve a practical purpose to be successful. “Most apps that do take off usually address a real problem voiced by real people,” said Ching. This article first appeared in the GrainsWest Winter 2019 edition and has been reproduced with permission.